After months of experiments I finally found clear coat which would not affect Alclad paint's shades - Gunze acrylic clear gloss (H30). I've painted couple aero elements in Alclad Stainless Steel and sprayed H30 over. I initially felt that Alclad Polished Aluminium shade was too bright. After I compared SS and PA shades, though, I realized that SS is too dark. So my final choice is Alclad PA. And the fact that PA shade is not affected much by Zero 2K clear coat is great too. Here is picture of MP4/22's body with Alclad PA on it, but before clear coat. There is a problem with it - every smallest blemish in base coats shows up. I'm really not looking forward to starting all over again, but not sure I could live with current quality either. We'll see how it'll look after clear coat is on. I found following deficiencies and inaccuracies in the kit. I mostly created this list to keep for myself, so I remember them and can decide, which ones I will fix. While my F248 is waiting for new brakes and new polishing kit to arrive, and MP4/22 in different stages of preparation, I could not resist and started RB5 as soon as it arrived. I'm finally back with CNC and machining. After 3 attempts and over 10 hours of trying I managed to adjust Z column on my Mill to some acceptable level. It may not be good enough for long CNC jobs, but is OK for small ones. Like making holes in brake disks and hubs. Main motive to returning to machining is the need in new brake parts for my F248, MP4/22 and MP4/5B builds. Brake details in Fujimi and Studio27 kits aren't that good MP4/5B brakes will also benefit quite a bit from machined parts. Plan is to make disks with round vents first and then reposition rotary table horizontally, so square vents can be machined for F248 and F2007 brakes. Ferrari has being using brake rotors with square vents for quite a few years now. It's great to have Mill back working after months of downtime. Parts, which needed to be glued before painting are in place and first layers of primer are on. Lots of sanding and puttying work ahead. Changed setup a bit. Got two lights now. Nikon D70's auto program thinks exposure should be a lot darker than I need. Switched to full manual and got more light. Need quite a bit of experimentation. Following DIY guide from strobist's blog I've constructed my own box. Took about 1.5h. Not the nicest one, I guess, but should do the job. First test shoots aren't very exciting. Probably still not enough light. Going to try two lights on each side of the box next. It's been a while. Got 2 different saddle nuts in a mean time - wrong first and then correct one. Took weeks of waiting. Installed correct one last week, but issue isn't fixed completely. Saddle moves nicely when headstock is off, but as soon as I put headstock on, it starts to squeal. This suggests that alignment goes off under weight of headstock. Not sure what to do about it. Attempt to use it like that will most likely lead to damage of new saddle nut. Heard about some people using counter weight to balance headstock. Looking for solution at the moment. All milling and scratch building effectively remain stalled for now. I've tried to machine a diffuser for R25. Miscalculated stock size and ended up with no support outside frame at all. But actual problem appeared when my mill stopped to make moves on Z axis. Looks like saddle nut got damaged, because I failed to adjust backlash lock. Didn't realize it wasn't setup at all, when milling column arrived new. Waiting on for new saddle nut to arrive from Sherline. Here is the picture of machining process before part was ruined. 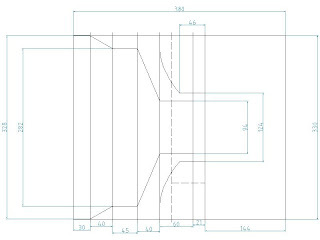 Correct roughing toolpath was generated using PyCAM. It was not optimized and lot of movements over Z axis were required. But job could have been done if mill hasn't failed. For my second attempt I'm going to use bigger stock and generate more optimized toolpaths. Fitted clear acrylic door to the front of paint booth. It's ready to use now. Going to start 3 new modeling projects - F248, 641/2, 126C2. Started to machine uprights from R25. Rears are basically done. Fronts are almost finished, just need space for calipers to be machined out. Finally starting to see some results. Spent a small fortune on equipment, but at least software was free and open source. All milling is done under control of EMC2. All toolpaths are generated by PyCAM. Both are great programs. I don't have good light setup and upright are kind of hard to capture under current light. Here is picture I have at the moment. Might update it later with better picture. Here is new adventure waiting for me. Bought this kit recently. It should contain all I need to start my experiments with resin casting. First tryouts will most likely fail, but there are lot of manuals in the Net and I should be OK in a short while, hopefully. My machining shop consist Sherline CNC Mill with Xylotex driver and PC. Sherline Lathe is manual at the moment, but I have plans to update it to CNC control in the future. Beside these there is also a metal band saw, which is small, but cost quite a lot of money. However cutting stock with hacksaw is no fun. Cutting a lot of stock with hacksaw is big PITA though. Here are some shoots of my progress on paint booth. Box made from playwood. Powerful vent motor attached. Few feet of duck pipes. PS: Please don't pay attention to the mess around. It's going to be cleaned, eventually. Here are pictures from 2D drawings for R25's wheels I've made. They are kind of confusing, but I'm not a professional. Suggestions on how to improve them are welcome. CNC shop setup - I spent quite a lot of time buying used and new parts, assembling machines, researching available stepper and servo systems and finally assembling my own CNC Mill with Xylotex drives. Process was lenghtly, expensive and took quite a lot of effort. If I had to do it again, I would rather buy complete CNC ready Sherline machines and ready to use Xylotex boxes. That would seem like more cost upfront, but would save money at the end, requires lot less effort and be much faster. Anyway, I eventually got machines up and running and now can produce parts on my Sherline CNC Mill and manual Lathe machines. CNC software development - Apparently there is no CAD/CAM package among commercial systems priced to be affordable by modeling hobby enthusiast. Unless you produce stuff for sale and it makes very good profit, you wouldn't be able to afford invest few thausand dollars into commercial CAD/CAM system. So I set out to find free open source alternatives. 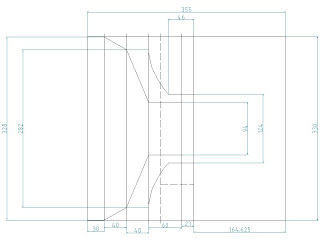 I found CAE software called Salome, which includes pretty powerfull geometry module. It doesn't have suport for parametric modeling, as commercial systems have. 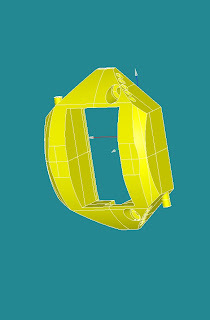 But it's based on robust and powerfull OpenCascade platform and provides most of other typical features of 3D CAD. All my 3D CAD models created to date, were done in Salome. Situation with CAM is not as good. There basically isn't any feature complete free open source CAM system at the moment. Lot of different open source CAM projects were started and stalled or died over years. Two recent ones, which still alive and showed some promissing potential are PyCAM and HeeksCNC. HeeksCNC developers apparently found Adaptive Clearing code created by guys from freesteel.co.uk site and integrated it in. I've being testing and helping to develop features for both projects. PyCAM was most instrumental in creating toolpath I used so far. 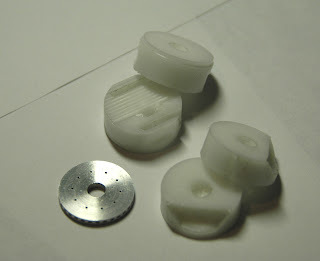 Machining parts - apparently making parts on CNC and manual machines takes quite a bit of time and effort too. Beside stock, supplies and cutting tools aren't that cheap. Surprize. I did not realize how much I would need to invest into machine shop, before I can produce parts, which would otherwise be printed via available services on 3D printer. In theory in a long run machining my own parts should have being less expensive then having then 3D printed all the time. In reality I still have to send some part for 3D printing, because I could not machine them and costs of running CNC machines isn't low either. Custom paint booth building - this is another project I initially took on to reduce costs, but ended up paying more in the end. Again it took a lot of effort, more money then one ready to use and quite a lot of time to finish. It's actually not yet 100% finished, but basically usable. Long winding post. But at least some of the side projects are finished or almost finished and I can concentrate on modeling more. Oh no, wait, there are more projects on a horizon. Need to cast resin copies of F2002's seat, so have to master resin casting. Then will have to print some custom decals for R25 too. Never ending story, but keeps me busy and sane. Here is an example of CNC machining and toolpaths generation I have to do to produce some of parts for my 1/12 conversion projects. On the pictures are screenshoots from EMC2 CNC control software and shoots of part at different stages. I've decided that number of parts for my 1/12 conversion projects better be printed on 3D printer, simply because I have no other way of scratch building them. Great service at printapart.com was mentioned in posts from gpma mail list. I'm trying to fill up printing volume to decrease price per part and make as many 3D models as possible for all current and planned 1/12 conversions. And beside that correct Brembo calipers for Revell's F2002 model if course. Latest 3D model is brake rotor for F2007. It has distinctive vents configuration, which would be impossible to reproduce using machining equipment I have. So, I decided to add it to 3D printing order. 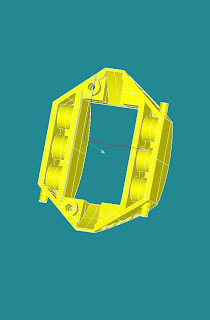 Before that I've finished 3D CAD models of AP Racing brake calipers for R25 and MP4/20 conversions. They have to be printed too. My attempts to machine them failed, as calipers are way too small and complex in shape to make on CNC Mill. R25 diffuser's CAD model was most complex to date I had to create. After it any other models will be simpler. This project got some good traction recently. I'm going to post more updates shortly. I have many project going at the same. Instead of posting updates to different forums and blogs, I decided to create my own blog and post updates as I go. I will let blogspot server to sort posts by categories. This way anyone interested can select and follow only posts for particular category.